Camille Pissarro was born in what are now the Virgin Islands but his father, a French citizen, sends him to study in Paris. Once he completed his education, he returns home and begins working in the family business. At age 21, he decided to devote himself to painting, and leaves home to move to Venezuela along with Fritz Melbye, a Danish artist who became his first teacher. Shortly thereafter, he returns to Paris to broaden his horizons and continues studying next to the artist’s brother, Anton. In France, Pissarro’s artistic career begins. In those days, the artist paints realistic landscapes outdoors according to the demands of the Paris Salon, the official committee of artists who dictated that kind of art was acceptable or not. But his search soon leads him into a new direction at the same time he befriends Monet and Cézanne, other artists who also disagree with the guidelines of the Salon. With them and others like Manet, Renoir and Degas, they establish the Société Anonyme des Artistes, Peintres, Sculpteurs et Graveurs. The members of this society are the ones that, in the future, will be known as the Impressionists, Pissarro being the head of the movement. They organized the first Impressionist exhibition in 1874 as an alternative to the exhibition of the Salon. Public opinion destroys them: art critics, accustomed to religious, historical and mythological scenes (which were the “acceptable” motifs of the official academy), believed that the art of the group was vulgar and that their technique was sloppy and rustic. Only Émile Zola, author and art critic, recognizes the merit of these artists. After six years of working with the Impressionists, Pissarro meets Seurat and Signac, two pointillist artists who, instead of using brushstrokes, painted their canvases with tiny dots of primary colors. These dots, in the distance, are perceived as a whole and the colors blend each other to form new and different tones. Pissarro shifts to this type of art, and paints similar motifs to the ones he used to paint when he was young working in Venezuela. His concern for color theory was still intact, but he felt the pointillist technique was too rational and, therefore, less spontaneous. After four years he turned away from this neo-impressionist phase claiming its system to be too artificial, and returns to the type of painting he was accustomed. But far from being an involution, this return shows a more mature Pissarro, with a more subtle and refined use of color. The old artist begins to suffer from a recurring eye infection that prevents him to paint outdoors, except on warm days. That is why his last paintings only show views from inside rooms. In the late 80s, Pissarro rented a room at the Grand Hôtel de Russie, at the corner of the Boulevard des Italiens and Rue Drouotin, in Paris. From his window he has a privileged view of the Boulevard Montmartre, and paints a series of 14 paintings of the landscape in different seasons and under different climatic conditions. These works are curious due to the artist’s elevated viewpoint. 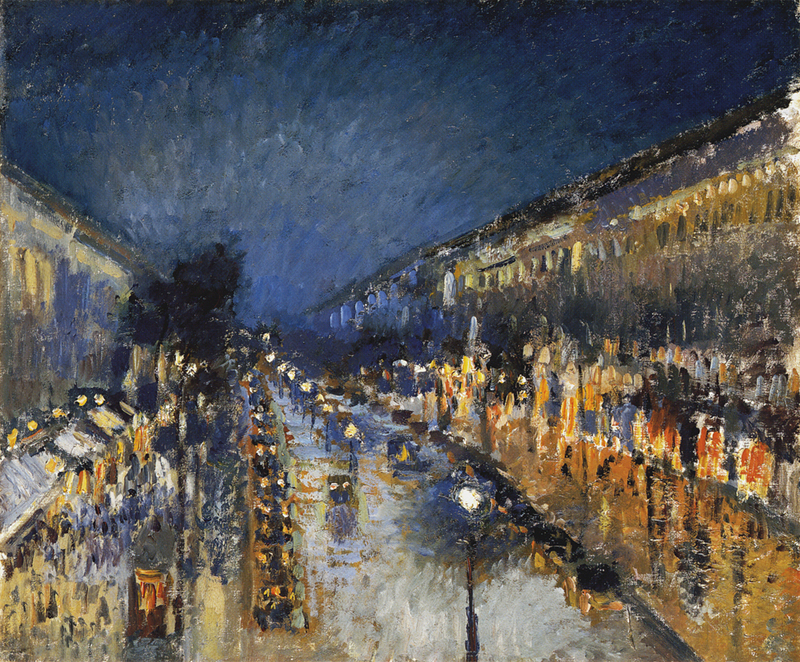 Boulevard Montmartre at night is one of the paintings of this series that I find most interesting one. If we consider that the Impressionists usually painted with daylight, this painting is curious because it is the only in the series that portrays the scene at night. What we see in Boulevard Montmartre at night is not a copy of reality, is an impression of the landscape. There is no figure that needs to be highlighted over another, no hierarchy. The brushstrokes vary in each color field. They lengthen, shorten and change direction in different areas in the canvas. While from above, the color of the brushstrokes of the sky are uniform and subtly become clearer towards the vanishing point; the color of the brushstrokes in the lower right corner mix between each other chaotically. These different textures make the painting dynamic and spontaneous. The figures of the landscape are not explicit: Pissarro uses color to suggest different figures, and this is where the artist allows the viewer to dialogue with the painting. The brushstrokes allow us to perceive a calm and peaceful landscape, where the artificial lights of the street are reflected by the wet streets. On the left, we can see a restaurant while, on the right, we can see business storefronts on the ground floor of the buildings and, above them, find residential apartments, which remain in the dark. Personally, I think this canvas is special because it doesn’t intend to portray a landscape, but rather to express a sensation. ~ by Álvaro Mazzino on November 9, 2012.
ja myślałem, że lecz wciąż na filmach. – Owe kiepsko przypuszczałeś. – Wagner się zaśmiał. czego, niemniej jednak szparkie sklep internetowy a także niełamliwe. This entry was posted on November 9, 2012 at 16:37 and is filed under Impressionism.You can follow any responses to this entry through the RSS 2.0 feed.You can leave a response, or trackback from your own site.